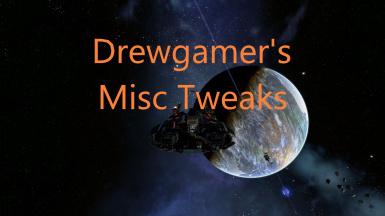 Collection of miscellaneous tweaks aimed to change the feel of the game, while attempting to stay as close to Egosoft's original vision. crystals now glow a color according to "rpg rarity" (white, green, blue, purple, orange): thanks to Shuruna's Crystal Finder mod! I wasn't quite happy with how some things felt in the game (mainly combat) so I set out to make things feel a little more..."right". The mod will comprise a collection of various tweaks I make to my own game as I play through. Currently this is focused around combat, but I hope to add various other tweaks as I come across them. crystals now glow a color according to "rpg rarity" (white, green, blue, purple, orange): thanks to Shuruna's Crystal Finder﻿ mod for the idea! Download the file, extract the "DMT" folder and move it to your extensions folder. Simply remove the folder, no save game issues whatsoever. Should be fairly conflict-free, however it will conflict with mods that change anything mentioned in the features section. Most of these changes are pretty simple to make yourself, so feel free to use what you like here in your own mod.